While Le Corbusier's urban projects are generally considered confrontational in their relationship to the traditional urban fabric, his proposal for the Venice hospital project remained an exercise in preserving the medieval fabric of the city of Venice through a systemic replication of its urban tissue. 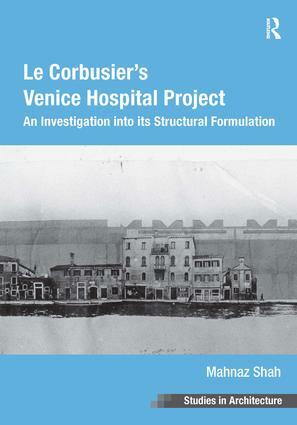 This book offers a detailed study of Le Corbusier's Venice hospital project as a plausible built entity. In addition, it analyses it in the light of its supposed affinity with the medieval urban configuration of the city of Venice. No formal attempt to date has been made to critically analyse the hospital project's design considerations in comparison to the medieval urban configuration of the city of Venice. Using a range of methodologies including those from architectural theory and history, using archival resources, on-site analysis, and interviews with important resource persons, this book is an interpretation of the conceptual basis for Le Corbusier understanding of the structural formulation of the city of Venice as mentioned in The Radiant City (1935). In doing so, it deciphers the diagrammatic analysis of the city structure found in this work into a set of coherent design modules that were applied in the hospital project and that could become a point of further investigation. Architects and other architecturally interested laypeople with an interest in Venice will find the book a valuable addition to their knowledge. For architectural historians the book makes an important link between modernism and the historically grown Venice. Contents: Foreword, Robert Maxwell; Foreword, Tim Benton; Introduction; History of the project; The urban context; Analysis of the project; Important findings; Table of important events; Bibliography; Index. Dr Mahnaz Shah is a Lecturer in Design Theory at the Cardiff School of Art and Design, Cardiff Metropolitan University.